More than two years after an estimated 20-meter class meteor fragmented high over the Russian city of Chelyabinsk, new data reported by NASA researchers this week reveals that — over a four billion year timeframe — the meteor’s orbital parent body itself had likely been geologically-impacted as many as a dozen times. Two 15- to 20-gram samples of the Chelyabinsk meteorite that NASA obtained from Russia over a year ago reveal a broad range of information about the meteor’s mineralogy, bulk composition and age, as noted at the Lunar and Planetary Science Conference in Houston. These same fragments came off the path of the fireball somewhere around the middle of its trajectory through Earth’s atmosphere, Kevin Righter, the lead for meteoritic sample analysis and the Antarctic meteorite curator at NASA’s Johnson Space Center, told Forbes. 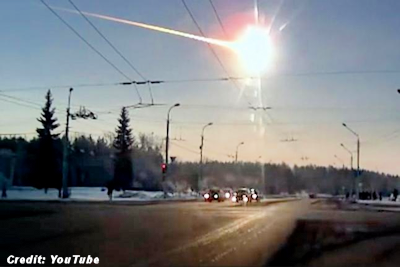 He says the fragments — pieces from the outer portion of the meteor itself which streaked across the Russian sky on February 15, 2013 — are typical of more stony-type meteorites and made up of some 90 percent silicate; five percent sulfide; and five percent iron-nickel. The original crystallization age of the parent body asteroid, says Righter, might be 4.5 billion years old. But in this case, he says, they found multiple ages using three or four different chronologic detection techniques. . . .